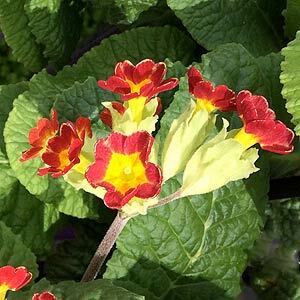 A wonderful free flowering species, Primula veris with its pendulous golden yellow flowers is a great choice for a shaded position in the garden. 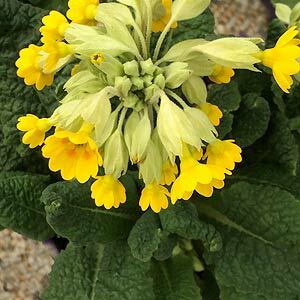 Also known as the ‘English Cowslip’ this is a species that has been heavily hybridized with many different varieties and flower shades available for sale. The species has attractive yellow flowers in spring that appear over rosettes of good green foliage. Reaching a height of around 15cm P. veris will grow well in light shade in a humus rich moist soil. Also suited to mass planting in containers. Given adequate shade and moisture P. veris is easy care. We fertilize with a liquid seaweed fertilizer in early spring and follow up with some pellets of chicken manure in late spring. Over time a large clump will be formed and plant can be divided at any time of the year when it is cool. This is the easiest method of propagation. As with so many plants, hybridisation has brought us varieties not found in nature. P. veris ‘Orange Shades’ or ‘Sunset Shades’ is one such cultivar. red to yellow fragrant flowers, evergreen foliage and reaching around 25cm in height.